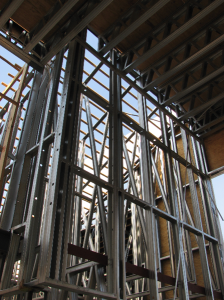 Cold-formed steel framing is allowing South Africa to build more quickly and for less to address the nation’s housing shortage. Here’s how. The Zulus of South Africa have a proverb about the importance of getting the job done. Ungexoshe mpalambili, which means, “You can’t chase two antelopes at once.” As you concentrate your energies on one buck, the other gets away. In other words, focus on one target — the best one. In South Africa, that target is to build residences and commercial structures more efficiently. To do so, more and more engineers and builders are opting for cold-formed steel (CFS) framing systems over conventional building methods. “South Africa is having success with CFS systems,” said Don Allen, P.E., Director of Engineering at Super Stud Building Products, Inc. In 2012, Allen visited South Africa, where he met with engineers and builders and saw the rainbow nation’s use of CFS framing firsthand. South Africa has a variety of climates. Johannesburg feels like a mid-Atlantic city. Durbin is tropical with palm trees. Cape Town is coastal. Mountains comprise much of the terrain. “I saw beautiful homes with panoramic views from their verandas,” said Allen of his trip to the country. An upscale home under construction in South Africa features cold-formed steel. In contrast, CFS — or, light-steel frame building (LSFB) as it’s known in South Africa — installs quickly, occupies little room on site, helps to keep trade traffic down, and offers long-term energy efficiency benefits, Barnard said. Allen said that South Africa uses the Australian/New Zealand design code. That code has similarities to the CFS framing provisions contained in the American Iron and Steel Institute’s AISI S100 standard. However, there are some differences in how South African designers and builders use CFS. Some structural CFS studs and tracks in South Africa are thinner than structural members in North America. 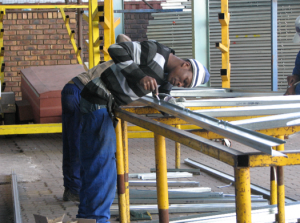 Instead of using 8” or 10” deep box or back-to-back headers over door and window openings, South African designers and builders use a type of “mini truss” header. It’s made of track, top and bottom, with diagonals that look like the diagonals in North American open-web floor truss systems. Extra layers of track. For longer spans or heavier loads on these built-up headers and joists, the top and bottom track doesn’t have enough shear capacity to transfer the required loads, so South African designers add an extra layer of track or flat plates on both sides of the headers. South Africans build diagonals into the wall panels. Just about every panel has some sort of CFS diagonal, to provide lateral strength and help keep the panels square. South Africans tend to use CFS with different coatings. Allen said magnesium oxide sheathing is more common in South Africa than in North America, replacing gypsum board finishes. Thinner steel, higher yield strength. South African structural CFS is typically 0.8 mm thick, but sometimes goes up to 1.2 mm. But that’s the limit due to South African roll former machines. They are able to get strength for longer spans and higher loads by using high yield strength steel. South African CFS floor joists use lightweight material, but South African engineering techniques allow them to span long distances. Because South Africa uses a lighter weight CFS than what’s common in North America, building heights tend to be limited to two or three stories, Allen said. Allen said that there’s vast potential in South Africa to go higher with CFS by using thicker material. It’s up to the big players in the South African steel industry to do more to promote CFS, he said. 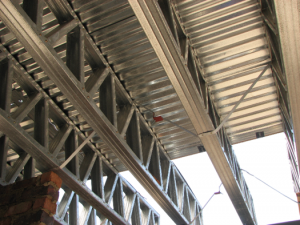 South African fabricators build CFS wall panels, floor joists and trusses. 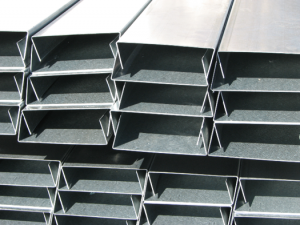 Want to learn how cold-formed steel can benefit your next project? Request project assistance.